Black Diamond's 16-liter Bullet backpack has thoroughly entrenched itself in my daily life, serving as everything from my climbing daypack to my travel carry-on to even (alas, yes) my manly diaper bag. The Bullet offers a refreshing dose of simplicity in an age where today's typical daypack is overloaded with superfluous and frilly features. Note that the Bullet has been modestly redesigned in 2009. The new Bullet loses the internal compartment divider/hydration pouch, shortens the zipper on the front slash pocket, widens the shoulder straps, and gains two ambiguous tool loops on the front exterior. There are also some differences in the panel construction, such that the new Bullet feels very slightly smaller than the original, and a has a bit less structure. To be honest, I think the original Bullet is the better pack, and if you can find one, I'd recommend going with it versus the updated newcomer. Still, in either version the Bullet remains a fine and very functional daypack that hits that 'just right' balance of capacity and compactness—and weighs only 12.7 ounces (measured). 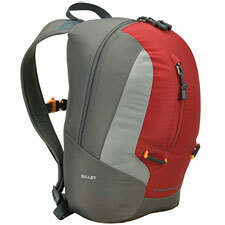 It's strange to think how hard it is to find a simple daypack like the Bullet these days. Other packs in this size range tend to overemphasize the importance of hydration compatibility, turning once-versatile daypacks into specialized and overbuilt Camelbak carriers that really don't appeal to those of use who prefer to carry our water in bottles. I want a simple daypack with one or two compartments and at least one zip pocket. That's it—no more, no less. That about describes the Bullet, which is perfectly at home as a scrambling/climbing pack or carrying your books en route to my favorite alma matter, Old School. Complaints? The Bullet's back panel is plain and completely unpadded, so your heavy DSLR might give you a poke in the back. There is no mesh or air flow channel. I'd like to see the Bullet use the removable waist belt design of the Black Diamond RPM—I never use the waist belt, but I can't bring myself to cut it off with scissors. I'd also like to see a bit more lateral curve to the shoulder straps to keep the pack stable against your torso, or let you sling the pack on with only one shoulder strap. But you know what? Overall I'm very satisfied with the Bullet. Maybe it's not high-art perfect, but when you carry it around as much as I do, it starts to feel like family, and that's good enough to get my recommendation.